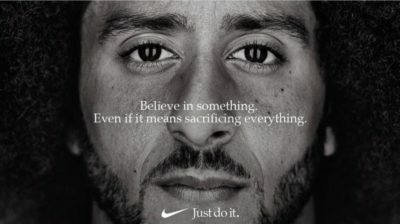 Colin Kaepernick is one of the faces of Nike’s 30th anniversary “Just Do It” campaign. Kaepernick released a photo on Twitter which featured the message “Believe in something. Even if it means sacrificing everything.” across his face. Although he has been signed to the company’s endorsement roster since 2011, this is the first time in the past two years he has been featured in an ad campaign. While taking a knee during the national anthem to protest against racial injustice and police brutality in this country, Kaepernick became the face of a modern day movement while sacrificing his career. Kaepernick is currently being ostracized from the NFL because many of its supporters are against racial equality in this country. Those individuals are threatened at the idea of all American citizens being treated fairly. Kaepernick is in the process of suing NFL owners for allegedly colluding to keep him out of the league for taking a knee. And of course, their are people who want to keep minorities marginalized; this one tweet sums up their beliefs.